Vanguard Cleaning Systems of Minnesota is a commercial cleaning and janitorial services company. In partnership with our franchisees, we’ve served businesses in the Rochester, Minneapolis, and St Paul metro areas since 2005. 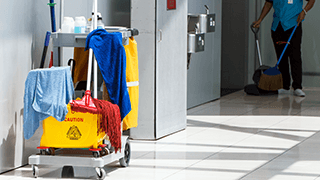 What should you consider before choosing a commercial cleaning service that’s right for your Rochester, Minnesota business and the people who spend time there? How many days per week do you need cleaning? What about carpet cleaning and hard floor maintenance? We provide a customized cleaning scope that fits your company’s unique needs and budget. What’s right for a small office is not a good fit for a high traffic public building.